In the Gospel according to St Mark, Chapter 10, Verse 25, Jesus is recorded as having said: “It is easier for a camel to go through the eye of a needle than for a rich man to enter the kingdom of God.” In the 2000 plus years of the existence of Christianity, the view expressed by Jesus has lost much of its currency. 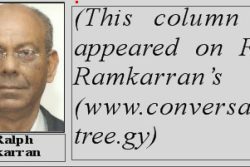 In an article for my blog, www.conversationtree.gy, published in last week’s Sunday Stabroek, I took issue with a statement by former President Jagdeo that implied that Cheddi and Janet Jagan lived in luxury. As expected, the events at Babu John attracted wide attention and media coverage. This month the PPP celebrates the life of Cheddi Jagan. In preparing to face the electorate, the party will be today invoking his legacy at Babu John. The responses of the PPP to The Cummingsburg Accord by APNU and the AFC were a declaration by President Ramotar that it is a “farce” and the unleashing of Ms Elisabeth Harper as its prime ministerial candidate. The Cummingsburg Accord is only the latest in the history of alliances in Guyana’s post-war politics. The last general and regional elections were characterized by extensive delay in announcing election results and there was an outcry against it. Whose spanner in the works? Working alongside and observing Dr Jagdeo (then Mr Jagdeo) at close range in the PPP for twenty years, I know that he must be enormously tickled at the controversy generated by the court action challenging the presidential two-term limit. Guyana is in virgin, unexplored, political territory. In various interviews both Opposition Leader David Granger and AFC Leader Khemraj Ramjattan, have indicated that the period of foreplay between their parties is over and consummation is in progress. The election date has been announced. Because it is just under four months away, the campaign will start slowly. No matter how often it happens, no matter how much our ears become attuned to the ring of abuse in politics, Guyanese must never allow themselves to become accustomed to it or to be entrapped by it, and to succumb to the temptation of silence. In a recent advertisement, shown above, the National Independent Party (NIP), led by Mr Saphier Husain-Subedar, until recently known as Mr Saphier Husain, announced its intention to contest the upcoming elections. If the PPP/C is returned with only a plurality of the votes at the upcoming elections as in 2011, it could adopt the sensible course of inviting the opposition to join it in a coalition government. The electorate will be called upon in 2015 to decide the political shape of Guyana for the immediate future. A constitution defines the basic laws, structures for governance and rights and responsibilities under which a society is organized. For some who oppose the PPP, an alliance of opposition political parties to contest elections has always been a prime objective. The notion in 1950 by the leaders of the PPP that freedom will bring justice has not materialized. Guyana has hit world headlines several times in its modern history. The news that created these headlines has been negative and related mainly to political events, although the reason for Guyana’s position on the map in recent times, Jonestown, was not essentially political as far as the outside world was concerned. As if the political controversies were not enough, the rains and inevitable floods brought more woes to the populace. Proroguing parliament is a legitimate constitutional device in Westminster constitutions, whatever its origins and the purpose for which it is used. Slipping through the back door? President Ramotar said in his address to the nation last week that if the opposition persists with the no-confidence motion, he will “prorogue or dissolve” the National Assembly. Navin Chandarpal was one of Guyana’s best known public figures and politicians. His popularity was so extensive that most people who knew him well, even those who did not share his political views or allegiances, felt honoured to be considered by him as a friend. The Clerk to the National Assembly has sought, in a letter to the press, to answer my article last Sunday in which I contended that the Speaker must convene the National Assembly now. The speaker is obliged to convene the National Assembly now! There appears to be no consensus among parliamentary parties about a date for the first sitting of the National Assembly after the just concluded recess. The death penalty has not been carried out in Guyana since 1997. While it is true that there has been a large increase in murders since then, murders have equally soared in countries which have abolished the death penalty like South Africa as well as in countries which have not, like Jamaica and Trinidad and Tobago. Leader of the PNCR, Chairman of APNU and Leader of the Opposition, David Granger, has had to field questions recently about the effectiveness of the opposition which together control a majority by one of the seats in the National Assembly. The government has been given the choice by APNU to determine whether it wants local government elections or general elections. Since Rudy Collins, Chairman of what was then known as the Elections Commission, put his life on the line in October 1992 against rampaging mobs determined to trash the Commission’s offices and derail the electoral process, the Commission has been the target of politicians who seek an excuse for losing elections. I had the privilege of being interviewed on the Spotlight TV programme on Channel 9 in the distinguished company of Henry Jeffrey and Tacuma Ogunseye, both knowledgeable and experienced observers of the political scene. In his article last Wednesday in ‘Future Notes,’ (‘Some suggestions for constitutional reform’), Dr Henry Jeffrey, advanced extensive views on constitutional reform. The middle class, which supported the PPP in 1950 and was heavily represented in its leadership, began to divide on the basis of the ethno-political developments after 1955. General Secretary of the PPP, Home Affairs Minister Clement Rohee, declared at his press conference last week that the PPP has no problem with shared governance and the ‘winner does not take all’ principle. Even if the PNCR had been minded to support the proposed AFC motion of no confidence against the government, it is not now likely. The PNCR Congress is always an interesting time for political observers, not least because in recent times there has always been a challenge to the leaders and energetic contests for other positions. The AFC released on Friday last a letter to the President of Guyana in which it advised that it will be tabling in the National Assembly a motion of no confidence in the government. The census figures substantially confirm the analysis I made in an article ‘The future of the PPP’ published in November, 2012. Contempt such as Ambassador Hardt is accused of in relation to the Head of State is a serious matter. AFC Vice Chair, Moses Nagamootoo, announced that his party was contemplating a motion of no confidence against the government. Once again the issue of an apology from the PNCR has become topical. The Peoples’ National Congress (PNC) government nationalised the Demerara Bauxite Company in 1971. Violence and corruption in the police force can no longer be classified as allegations. The first appointment of a Queen’s Counsel in England was that of Sir Francis Bacon, made by Queen Elizabeth 1 in 1594, for a political purpose. This is an appropriate time, on the occasion of the celebration of Guyana’s 48th Independence Anniversary, only two years before age 50, to begin the assessment of our condition as an independent nation and try to assess the future. The case of Rudisa Beverages and Juices (Rudisa) v The State of Guyana, decided by the Caribbean Court of Justice (“CCJ”) on May 8, 2014, exposes not only the state of governance in Guyana over the past two decades but also symbolizes the complete loss of Guyana’s ability to achieve political agreement on any matter of consequence.